If you thought U.S. Department of Agriculture (USDA) loans were just for farmers, think again. Many homes in small towns and even the suburbs are eligible for USDA loans. But hey, if you are a farmer, you can probably benefit from this loan type too. A USDA Guaranteed Rural Housing Loan is a 30-year mortgage with an interest rate determined by the lender. They were long thought of as just for farmers, but the program has been expanded in recent years to help families without adequate housing finance the purchase of a home in a rural area. 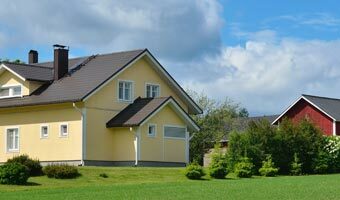 A USDA Guaranteed Rural Housing Loan is 30 years, with an interest rate determined by the lender. No down payment is required (yes! ), which sets these loans apart from more traditional home loans. Applicants may have incomes up to 115% of the area’s median income and must be able to afford mortgage payments, including insurance and applicable taxes. Credit score is also considered in the application process. Eligibility guidelines are very specific – but don’t let that stop you from achieving your homeownership goals. An experienced USDA financing professional at Waterstone Mortgage will help you navigate through the USDA loan process and determine if you are eligible. The property being purchased must be in a rural area as defined by the USDA. The property must be owner-occupied; investment or vacation properties are not eligible for USDA loans. You must meet the income restrictions for the county the property is located in. Each county has a maximum income limit defined by the USDA. This maximum income limit depends on the cost of living, median income, and other economic characteristics of the county the property is located in. What Are The Benefits of a USDA Loan? USDA loans offer several unique benefits that set them apart from standard home loans. USDA loans require no down payment, so qualified individuals can finance up to 100% of the home’s total purchase price. This makes them one of the more desirable loans available to homeowners. Contact Waterstone Mortgage today and a qualified mortgage loan professional will walk you through the USDA loan application process and answer any questions that may arise. Get started with a pre-approval! A USDA Loan is a government-insured loan subject to certain qualifications and restrictions. USDA guarantee fee and annual fees apply. All loan requests are subject to credit approval as well as specific loan program requirements and guidelines. With Adjustable Rate Mortgage loans, the rate is variable and may increase or decrease every year after the initial fixed rate period based on changes to an index. This could result in an increase in the monthly payment. Find a knowledgeable Waterstone Mortgage loan originator near you, and get started on the path to homeownership. We’ll be with you from application to clear-to-close, and every step in between. We're standing by to help you achieve your homeownership dreams. Contact us to get started today! Our blog, Mortgage 101, features easy-to-understand and engaging posts on lending process info and mortgage industry news. Waterstone Mortgage Corporation (NMLS #186434) is a wholly owned subsidiary of WaterStone Bank SSB (NASDAQ: WSBF). © 2019 Waterstone Mortgage Corporation. All rights reserved. Disclaimer: The calculated results shown above are based on conventional loan program guidelines. Other loan programs are available and may provide results that better fit your individual needs. Calculations completed within this tool are estimates and are not guaranteed to be accurate. Payments shown do not include amounts for taxes and insurance; actual payment obligation will be greater. This calculator assumes an owner-occupied, primary residence using agency conforming loan terms on a home purchase and a 640 credit score.PMI calculations use standard monthly premiums for fixed rate terms.Reduced premium and financed PMI may reduce costs. Actual PMI costs will vary based on loan program, loan purpose, credit score and other factors. Contact your loan officer for details. Disclaimer: The calculated results shown above are based on conventional loan program guidelines. Other loan programs are available and may provide results that better fit your individual needs. Calculations completed within this tool are estimates and are not guaranteed to be accurate. Payments shown do not include amounts for taxes and insurance; actual payment obligation will be greater.